By Amanda Glenn 34 Comments April 6, 2018 This post may contain affiliate links. One of the perks of breastfeeding was not having to deal with my period for a few months! Some women don’t get their periods back until they wean, but many women go through a time where they are both menstruating and breastfeeding. Here’s what you need to know about having your period while breastfeeding – when it might come, how it may affect your milk supply, and what’s normal. What might cause my period to come back earlier or later? Frequency of lactation is considered the most important factor, and this was backed up in my informal poll results (below). Many of the women that responded commented that their period came back shortly after dropping a pumping session. 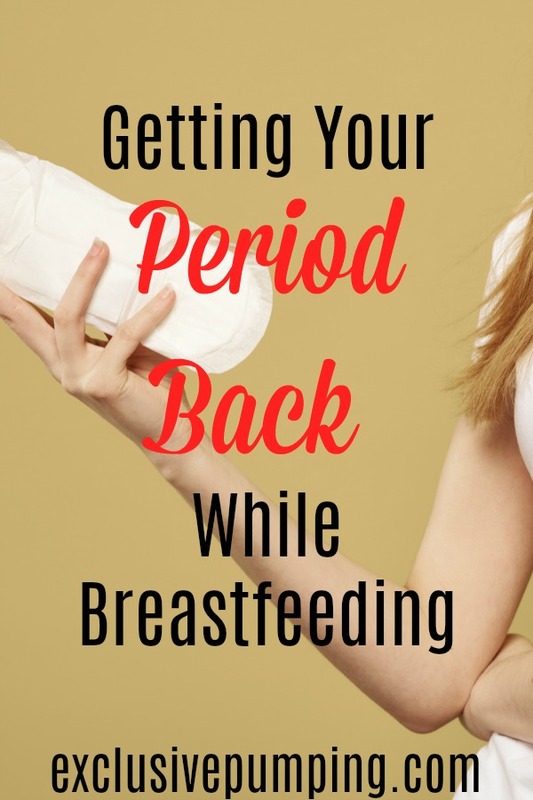 It’s also not uncommon to get your period back when your baby stops waking up at night, or when you drop your middle of the night pumping session. Hormones, the last one on the list, is kind of (in my opinion) a catch-all for “luck.” (“Crappy luck,” if you’re one of those who gets her period back at 6 weeks.) Women’s bodies react differently to lactation and the postpartum period in general – while one woman might nurse or pump twice a day for a year and not get her period until she weans, another might do the same every two hours and gets hers at two months post-partum. Will anything happen to my milk supply when I have my period? Many women see a temporary supply dip when they have their periods, where their supply goes down by a few ounces when their period starts and then rebounds when it ends. Other women don’t have a supply dip at all. If you find that your supply is impacted by your period, here’s more information about what to do when your period affects your milk supply. 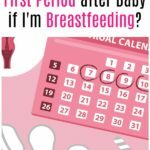 Are irregular periods while breastfeeding normal? Yes. Pretty much anything is normal when it comes to getting your period while breastfeeding! Once your period comes back, it could come regularly, or you could get one period and then nothing for months. Instead of coming on a regular schedule, you may constantly miss periods while breastfeeding and get it somewhat randomly. In addition, your periods might be very long or super short compared to how they used to be; they could also be heavier or lighter than you’re used to. Why is my baby fussy when I’m menstruating? This could be happening for a few reasons. First, as noted above your milk supply could be lower than normal, and your baby could be frustrated that they aren’t getting as much milk as would like. Here are some ideas if you think this might be the case. Your period might also slightly change the taste of your breastmilk. It’s still totally fine for baby to eat – it doesn’t make the breastmilk sour or bad or anything. He just might not like way it tastes quite as much (or he might like it more)! Do I have to worry about getting pregnant while breastfeeding before I get my period back? Yes. Even if you haven’t gotten your period back yet (your first ovulation will happen two weeks prior to that first period), you are exclusively breastfeeding, and your baby is less than 6 months old, it’s possible that you might get pregnant. If all of those three things are true, it’s very unlikely, but it’s still possible. If you definitely want to avoid pregnancy, you should take the appropriate precautions. Make sure that if you take hormonal birth control that you confirm with your doctor that it won’t cause issues for your milk supply. Generally speaking, you want to avoid birth control methods that contain estrogen while lactating because of the possible effect on milk supply. 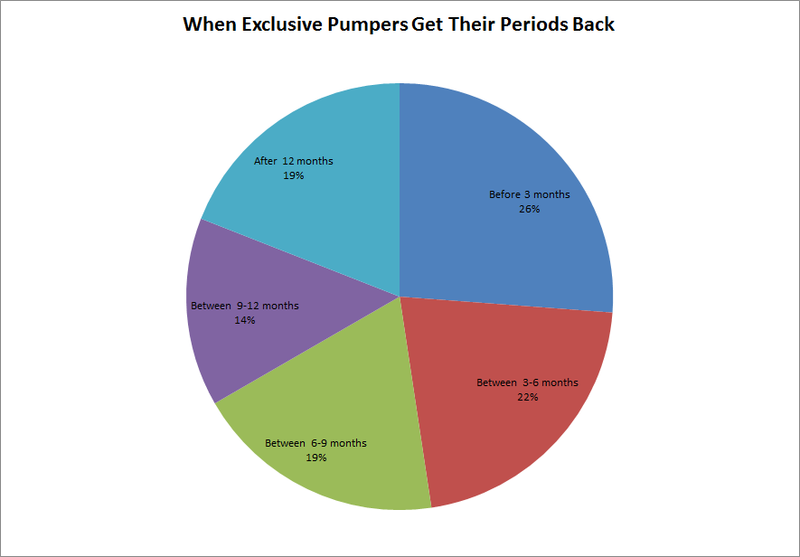 When do exclusive pumpers usually get their periods back? So how long does it take to get your period after having a baby when you’re breastfeeding? Of the 42 women that responded, almost half of them (48%) of them got their period back before their baby turned six months old. For comparison, only 7% of women who practice ecological nursing (nursing on demand, nursing lying down, no bottles or pacifiers, comfort nursing) get their periods back before 6 months. When I was six weeks postpartum with my first baby, I went to the bathroom and noticed a great deal of bright red bleeding. The bleeding that I’d had after giving birth had tapered off significantly, and I was surprised and a little worried. So I did what no one should ever do – I googled my symptoms. “Bright red bleeding six weeks postpartum” found me some helpful links, most of which indicated that I was probably hemorrhaging and should seek medical care. Luckily, I happened to have my six week checkup that morning. However, I was concerned that if something was really wrong with me, and I’d have to be admitted to the hospital, who would take care of the baby? So I told my husband he had to take off work and come with me. When I got to the exam room, I hurriedly told my doctor all about the bleeding. “I think you have your period,” she said. Pure genius! I made my husband take a day off of work to take me to the doctor because I had my period. At that appointment my doctor and I talked about pumping, and she said that she tends to see women that are exclusively pumping get their periods sooner than those who nurse. After that period, I didn’t get another one until nine months postpartum – so my experience with breastfeeding was my period started then stopped. I’m not really sure why or what happened. At nine months, I started getting periods regularly. At first, I thought this probably had something to do with adjustments that I’d made to my pumping schedule. However, looking back, I got my period back at nine months with my second and third babies, too, and I nursed them – so it’s possible that my schedule didn’t have anything to do with it. What has your experience getting your period while breastfeeding been? My doctor told me the same thing about how you are going get your period after a month or two and you will not keep up with your baby’s demands if you hand express feed only. Well, it has been 7 months and I started my period for the first time since giving birth yesterday and I managed to keep up baby’s demand. (Now that she is on solid food that helps a lot lol) I pump for 30 minutes every 5 hours. This style of feeding has been wonderful for our family and it works out great for my job. 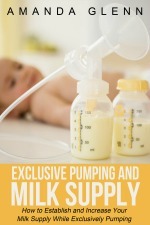 So happy to see an article on exclusively pumping breastfeeding! I exclusively pumped for my 2 year old and got my period back right away but I was only pumping 15-20 minuted every hour and a half. My 2nd child is 3 months, exclusively pumped breastmilk but, this time I pump between 30-40 minutes every 3-4 hours and am back at work. Had spotting last month and nothing this month but cramping and hot flashes. Got negative reads on pregnancy tests so it could be a mix of extended lengths of pumping mixed with holding baby more due to not seeong her at work and work stress as they added on my work load since I came back. Brewer’s yeast is a huge help for increasing supply! It’s the same ingredient that makes beer help with lactation only without the alcohol. 😉 I mix it with blended old-fashioned or steel cut oats, peanut butter, apple sauce/bananas, and chocolate chips for lactation cookies! Happy breastfeeding! I’m 7 months PP tomorrow with my third child and have been exclusive pumping since between 3 and 4 months due to lots of eating/allergy issues. I still haven’t gotten my period and I would like to get pregnant. My first are twins and I wanted another baby close in age to my third. I pump 5x a day and haven’t pumped during the night for many months. Should I drop a pumping session? Hi! I definitely think it would help to drop a session. Good luck! Im almost 4 months pp now, after 1 month i think i got my period but it only lasted for a few days i think it was just leftover blood from the uterus, is that possible? after birth you bleed then stop for 1 week then bleed (like normal period but only for a few days) then until now no bleeding happened and i have a negative result on the pregnancy kit. so i shouldn’t worry right? Yes, that happened to me too at 6 weeks pp. Then I didn’t get a period again until 9 months out. 7 months PP, pumping 3x a day and supplementing formula. Still no period! I was wondering why I still don’t have it so I googled it (I google everything ?) . So I guess it’s just normal. First let me say I do PE, I have a baby in the NICU for almost 6 weeks. We are working on breastfeeding so we try at least 3 to 4 times a day then I pump after. I actually got my period almost exactly a month after I gave birth. My period has lasted longer and seems heavier. Is this normal, any thoughts? It can definitely happen! My period definitely changed after I gave birth (longer/heavier). The worst! I did end up getting a Mirena eventually which helped. Just a thought. My little girl is in the NICU and I am exclusively pumping. I pump 4-6 times a day and I am trying to increase my supply with lactation cookies. I am only 1 month post part I’m and I think I just started my period….. I thought at first it was more postpartum bleeding but I started cramping and was really fatigued, which are my usual period symptoms. I’m also diabetic and have PCOS and I take metformin, which helps balance my hormones which I turn makes my periods regulated. I’m really bummed to have started my period already!!!! When I’m able to breastfed my baby will my periods stop? I hope so! Hi! It might but it might not. 🙁 Actually I had one period at 6 weeks and then didn’t get another until 9 months. Hopefully that will be the case for you, but it’s impossible to predict for sure. Good luck! I just noticed that I am spotting, but it looks like old blood, I am 2 months pp.. 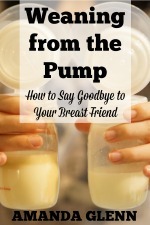 I have no choice but to pump since my little girl is in the NICU. I pump 3 to 5 times a day. I am supposed to do it every 2 to 3 hours, but it’s really hard doing so with a 2 year old getting into everything and being a heavy sleeper! I did however have my tubes tied during the c-section. I feel sluggish and a little crampy, but definitely not like I did before my baby was conceived. I do not produce much breast milk, but since mixing my prenatal vitamin and folic acid with fenugreek, I have seen a decent increase in my supply. Sadly it’s still only between 1/2 to 1 ounce out of both breasts together… occasionally I pump 2 ounces… problem is that I have diabetes, so that’s my answer to low supply. I hate having a period, but our bodies choose what they want to do lol. Sometimes I feel like I’m going to have my Period( feel little cramp) but it’s not coming . I also hope so too! First , I got my period when my baby is 6 months and has been getting my period regularly ever since. starting last month January my period stopped ,and this month ,February I still haven’t got my period back. I thought I was pregnant but I tested negative. I admit I did nurse my baby excessively especially at night . Now I stopped nursing her completely at night and I still nurse her 3-4 times during the day. I don’t want to completely wean her. However, sometimes I feel like my period is coming ( feeling cramp) but it didn’t happen. Wondering will I get my period soon ? Also , I want to get pregnant again , but without having my period, I thinks it’s harder for me to get pregnant. If I stopped nursing her at night and only nurse her 2-3 times during the day and only pump once in the morning, is it possible for me to get my period back or get pregnant? I think if you stop nursing at night you would probably get it back – that (not lactating overnight) has always been the trigger for me. Good luck! Great article. I am 8 months postpartum and just got my first period. I am currently pumping once a day (morning) and breastfeeding the rest of the day. Baby is on solid foods and is currently refusing to nurse due to teething, I have endometriosis and loving the benefits of no period. I am wondering if I increase to 3 pumping sessions and continue to breastfeed as much as baby will allow, can I get my period to stop and go back to a lactating amenorrhea state? It is definitely worth a shot! Everything is so dependent on your particular body, so no guarantee it will work, but definitely worth trying. Good luck! I BARELY pump anything. I have always had very low supply and have always had to supplement. Because of low supply and numerous other issues, my baby refused to nurse after 4 months. 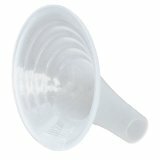 I tried everything you can imagine to get my supply up, but the most I was ever able to get while exclusively pumping was 15-20 oz per day. I am now 8 months postpartum and pump 4 times per day, but I only get about an ounce each time I pump. Baby is almost exclusively formula fed at this point. I still have not had my period. I’ve had multiple negative pregnancy tests, and I have no pregnancy symptoms. Before getting pregnant, I had very difficult periods due to endometriosis, but my periods were very regular. Does pumping have the same affect on hormone levels, even if you aren’t producing anything? I’m starting to worry….. I would say it’s possible it’s still affecting your hormones. A lot of women don’t get their periods back until they wean completely. If you haven’t gotten it back three months after you wean, I would go see a doctor to confirm everything’s okay. But I think it’s too soon to worry. 🙂 Disclaimer: not a doctor! Thanks for the article. I’m 5 months pp and EP. I pump 4X a day. No period yet. I would have assumed I would of gotten it by now. My doctor told me the reason is moms that EP get our periods back sooner is because we are getting in contact with the babies saliva like EBF moms are, but I’m 4.5 months pp and I pump 4x a day and still no period! Interesting… Based on everything I’ve read, I would have expected my period to be back by now. I was at two pumping sessions for a while, and I’ve been down to one pumping session per day for a few weeks now. My baby’s almost 11 months. Still no period yet. 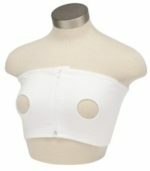 I just got mine back at 7 1/2 months post partum. It may have something to do with not being as consistent on pumping due to a change in work schedule and weekend activities. I also got my period back at 8 weeks. It lasted 10 days, twice as much as pre pregnancy….and now a week later seems to be starting again? Is this normal after pregnancy? Ugh – that sounds awful! I would ask your OB just to double check that it’s your period and not anything to do with your uterus (like retained tissue). I think that’s unlikely but better safe than sorry right? I’m so happy that I found this! My dr had told me that as long as I pump I wouldn’t get my period. Well, behold! At 8 weeks postpartum my period has returned. I was definitely looking forward to having more time without it but it looks like I’m not that fortunate. How did dropping to 3 pumps work out for you? And when you dropped to 3, how long did you pump each time…. ?